Common Name: White Sansevieria, Snake Plant, Mother-in-law’s tongue, Good Luck Plant. Family name: Ruscaceae (check wikipedia). Plant type: Indoor or outdoor ornamental plant, discovered by Gustav Bantel of St. Louis, Missouri and patented (Plant Patent No. 796) in 1948. Light: Prefers full sun, but can tolerate low light conditions. Moisture: Needs little water and is very drought tolerant. Allow soil to dry out between watering. Soil: Grows best in well-drained loamy soil. Propagation: By division of rhizomes at anytime of the year or leaf cuttings. For variegated cultivars, such as ‘Bantel’s Sensation’, ‘Golden Hahnii’ and ‘Laurentii’, propagation by division is the choice to retain the desired variegation. Features: Sansevieria trifasciata ‘Bantel’s Sensation, a sport of S. trifasciata ‘Laurentii’, is a slow growing plant with stiff, swordlike leaves that are erect like those of the S. trifasciata species. Leaves though are shorter (below 2 feet) and narrower (less than 2 inches) and are unusually marked with an alternating and variable pattern of longitudinal white and dark green stripes. Some leaves with wide green sectors may have transverse-banding of lighter green similar to that of the species. 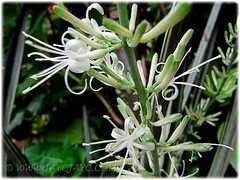 The fragrant flowers are creamy white on an 18-27 inches spike, blossoming in the hot season, though rarely. Usage: Great as a houseplant, not only for its attractiveness but also for purifying the air indoors. Sansevieria is the perfect plant for the modern interior with its architectural form and durability. Excellent sculptural specimen as a container plant for garden patios, or grouped with other plants in garden borders and parks. 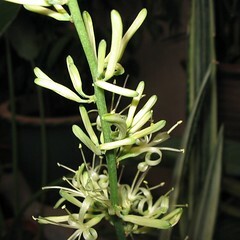 Sansevierias are also cultivated as a source of bowstring hemp (fibre), obtained from their leaves. 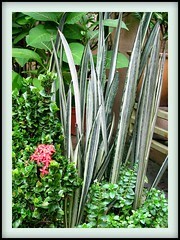 Care: White Sansevieria is absolutely an easy to grow plant that thrives on neglect. Tough and durable to a wide range of conditions. It is as easily grown whether on ground outdoors or in containers indoors. Fertilize only once during the growing seasons with a slow-release fertilizer. Repotting should be done only when necessary, probably when the tightly-packed, strong underground rhizomes breaks the pot or the need to propagate arises. No known plant diseases or pests. For temperate regions: USDA Zone 9 and higher. To know more about sansevieria’s culture, refer to fact sheet by International Sansevieria Society. More info on sansevieria: Read this very comprehensive Sansevieria Production Guide from University of Florida, IFAS to acquaint yourself with the genus ‘sansevieria’, its culture and the many species and cultivars. 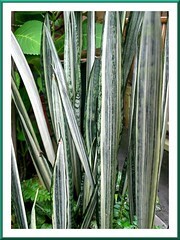 More Sansevieria images: Enjoy here! It was love at first sight when we saw this plant nearly one and a half years ago! It had only 2-3 stiffly upright sword-shaped leaves, but its unique pattern and color combination rarely seen on other sansevierias stole our hearts. A very hardy plant that not only can withstand the harsh sun and wet seasons (even though they’re drought tolerant), but can adapt easily when uprooted and replanted! I was absolutely flabbergasted when it survived in spite of being dugged out from an unfavourable ground spot into a container and then in less than 2 weeks relocated back into the ground at an ideal sunny spot in our garden! 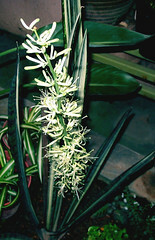 Latest Update on June 14, 2010 – Hooray, Sansevieria trifasciata ‘Bantel’s Sensation’ bloomed again last March! We were extremely delighted to enjoy its beautiful flowers and fragrance once again, after such a long absence! Another Update: March 10, 2012 – Yay! Two flowering stalks to charm us in February 2012!